Stir in egg, ginger and salt. 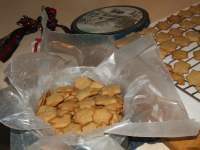 When dough is cold, roll out to about ¼ inch thick and cut with a 2" star shaped cookie cutter. Make some tiny stars (from a child's cookie cutter set) as well. Bake on parchment paper for 15 minutes in a pre-heated 325F oven or until golden brown. Let cool on a rack. The tiny stars, of course, take less time to bake. The small cookies are lovely accents for a dish of ice cream with mincemeat. Also the cookies can be sent long distance. I pack them in jam jars with the cookies facing outward (so they show through the glass) a coloured ribbon and a festive looking top to the jar. Cream sugar & shortening. Add eggs & orange peel. In a separate bowl, mix together baking powder, salt and only 1 c. of flour. Add flour mixture to creamed shortening. Stir. Add milk and vanilla. Stir. Press the dough out to about ¼ inch depth and using cookie cutters, cut into shapes. Use the other colours like plasticine to decorate. We have made little dogs with holly on their collars, angels playing instruments, Christmas trees, Santas, Initials decorated with holly for each child receiving the cookies, etc. etc. Try not to handle the dough TOO much; the cookies get quite hard and tough (although, as I said, kids don't seem to mind). We use very little cookie cutters so the cookies themselves end up being no bigger than one or two inches. BLM: READ the handle of the measuring cup FIRST before there are many tears of frustration. EJM: DON'T add red to make a better blue. LISTEN for the timer bell so that the orchestra and choir of angels doesn't turn out mahogany brown. If by some awful chance you don't hear the bell, you don't have to throw out the burned cookies, but can hang them on the Christmas tree. They look quite amazing. Beat in egg, vanilla and molasses. In a separate bowl sift flour, salt and baking soda together. Stir the dry ingredients into the wet. Stir in raisins (or a combination of raisins, chocolate chips and/or chopped pecans). Using a small spoon, drop batter, well apart, onto a cookie sheet covered with parchment paper. Bake about 10 minutes in a pre-heated 375F oven or until golden brown. Let cool on a rack.